The new Citadel paint range from Games Workshop is out in a couple of weeks and I was able to give them a try and review them today in the GW store in my local town. 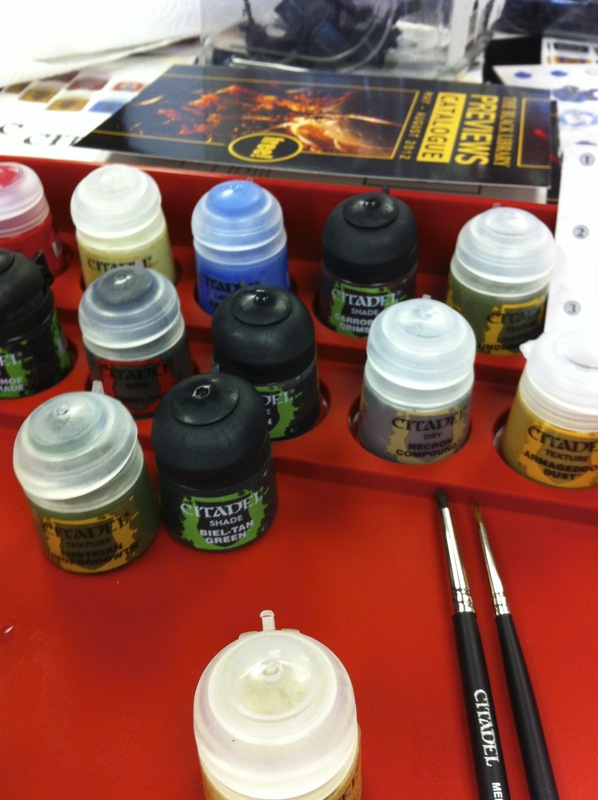 The paint range is much larger than before and here are my first impressions as I used a limited set of them in the shop today. I know there are people rushing out to buy the old stock and items like Badab Black, Gryphon Sepia and Devlan mud however after trying the new paints I think I can safely say that the new range has these washes and inks completely covered. With the older names in parenthesise these are the new categories of paints: Base (Foundation) , Layer (normal paints), Shade (washes), Dry, Glaze (inks), Texture and Technical. The foundation paints were certainly less chalky than the last set and were instead smooth and blended very well. The shop manager was keen to keep stressing that even the new white could paint directly over black. I am not so sure of this bold claim and personally "instant" coverage is not always something I want to achieve and I am happy to build up layers to get a perfect cover. However the Base paints I had in the limited set were very good at covering, especially the Caliban green on the orks skin, which I was painting over black. I had no lighter green, so had to add white to to it for the highlights. This was not a great method but I did find the blending was excellent and forgiving. 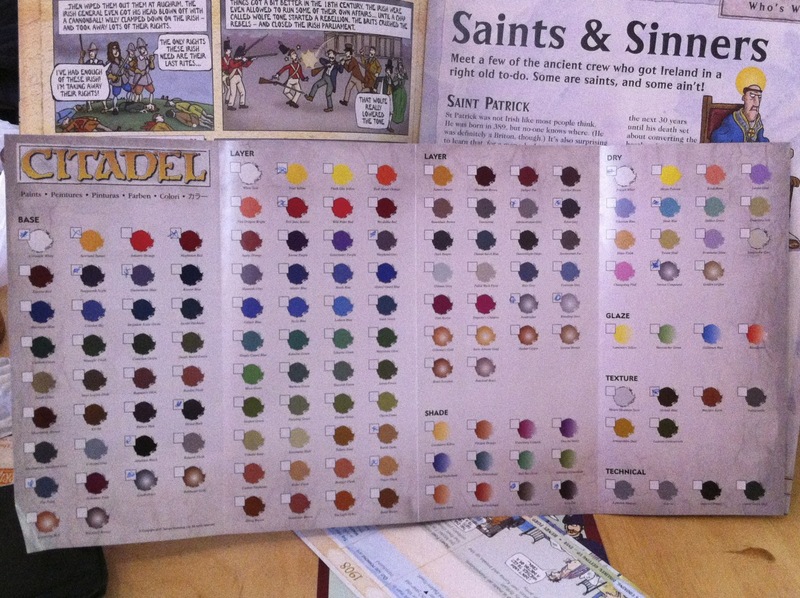 A bit like the Privateer Press P3 paints where you can go back and re-blend a colour easily. 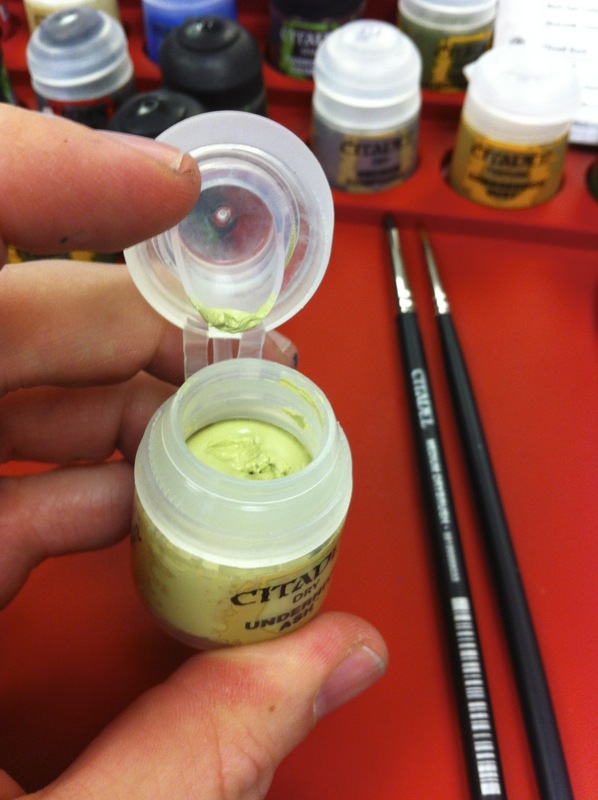 The best moment for me was using the LeadBelcher base metallic which was a nice dull tone and covered incredibly well, then washing it with with the Nuln oil shade, followed by Necron compound a metallic which is one of the creamy Dry paints (for drybrushing). When I say creamy I really mean it, the "Dry" range for drybrushing look almost like a gel in the pot or a thick set yogurt. The Necron went one very well as a sharp bright edge to the metal - I was painting very slapdash though! The Nuln oil was a bit like Badab black but there was something about the flow and coverage which had the edge on Badab for me. Going back over the higher edges of the axe with Leadbelcher gave it a really nice edge. I did not have the time to give anything a fine detailed finish because the store manager wanted someone else to try the paints, so the result below is not finished but I think you should get a feel for the way the washes have worked. I also used one of the green "shades" Biel-Tan I think (it was like an ink wash), which was brushed liberally over my ork skin. I was impressed by the fact that it did not over darken the base colours and I think if used correctly the entire range of new inks (Shades and Glaze's) are going to be great for fast quality painting. The Textures are supposed to offer a quick way of doing bases. I am not sure they have a big enough grain in them to show up well on a base. I had Armageddon dust which was a light buff colour texture. I think I would like to try the textures properly when I have more time with the paints but on first impression they don't look like a replacement for using a sand with fine gravel mix for textured bases. 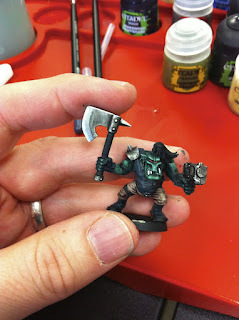 I did a speed paint in the store on this ork. A terrible model and whoever put it together did not care for seam lines or getting the parts glued together in sync, so his neck had a massive ridge. They only had a limited set of the new range in the store so I had to get creative with the brown and mix one of the "dry" colours into it to darken the colour for the Orcs legs. 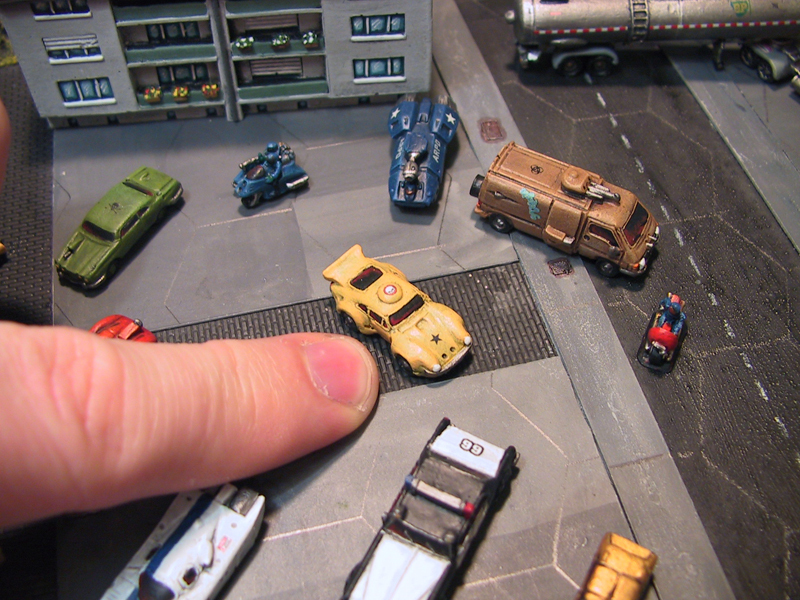 This was not a good move, because the "dry" range of paints are really for dry brushing and not base covering. The difference is stark, with the dry range being like a creamy gel which you would not be able to use to get a good base colour even when thinning them - they really are only good for edges using drybrushing. This is one of the dry paints. Used for drybrushing the paint is like a gel. It did work well to provide a great instant dry brush, but I do wonder how long the paint will last in the pot. They might have a magic ingredient in it to allow it to keep and not dry out (I hope so I bought some). The full range. I went a bit wild and bought a few from the set on a pre order from the shop. 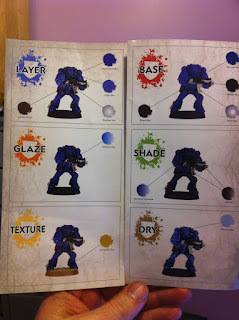 This small guide shows the six stage method they are suggesting painters take with the new colours. They have a full painting book "How to Paint" which comes with a set of handy cards and a lot of detailed photos of the paints used in stages on a lot of the GW models. 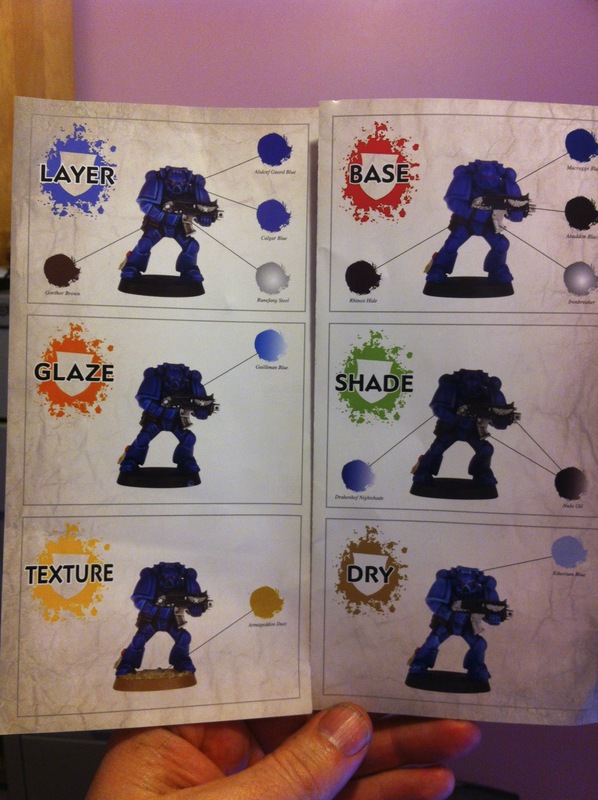 This Space Marine guide is a sample which takes you through the various colours. I must say that the photography on it is terrible, in almost all the images the Space Marine is very dark and it is difficult to see the difference! I did get to see the cards from the painting guide which had much better photography with clear illustrations of the stages needed on different faction models. Ah GW. I love them and hate them. It just makes sense they would release a line that filled previous gaps that modelers filled with other companies products. It baffles me though how consumers continue to pay so much more for GW when in many cases (like Woodland Scenics repackaged water effects) they are identical. For instance, Vallejo paints are not only made by the same manufacturer but indeed are manufactured in the same location and are identical to GW paints (besides the fact they cost less and you get more). I suspect it will be the same with this new line of paints. It's my theory that John Blanche cast a spell over early GW fans with his arcane imagery and it has been creating lemmings ever since (including myself for a time). I worry about the drybrush paint as well as. GW have changed their pots over the years to contribute to their "planned obsolescence" so I fear this stuff won't last long. I have a pot of salamander green that is STILL good and it was bought in 1989! That doesn't make money for GW so on the other hand I get it. I couldn't abide by the rate at which they began changing rules editions and nowadays I can buy a whole army of 15mm for the price of one 40k vehicle- for me the spell is broken. All in all though they certainly walk the precipice of value versus price point. I've often wondered when will they raise prices so high that the illusion is broken. The answer is not yet anyway. I agree on your point about longevity. I was not a fan of the last range of foundation paints and the few I had which were hardly opened - dried up in just over a year. However I do think these new paints are now from a different manufacturer. There is mention of them being made in the UK, but who knows! I do use Vallejo, P3, LifeColor and the GW range - so using these today I did find them to be a bit different from the previous set, so there is a chance they have found a different source. Hi Robin, Thanks for the review! It will be interesting to try out these new paints. 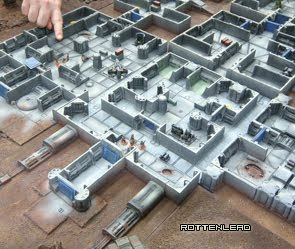 I have mixed views, personally think the foundation and wash paints were a step in the right direction in terms of quality (if not price and longevity). I still have GW paints I bought in the early 1990s that haven't dried out but (with some exceptions) the coverage of these paints is sometimes quite poor. I've not tried P3 but may give these a go next - could you do a review of P3? Cheers, Matt.